Today, nothing is much cooler than having a home that keeps you cool during the scorching hot summer days and warm during the chilly nights. 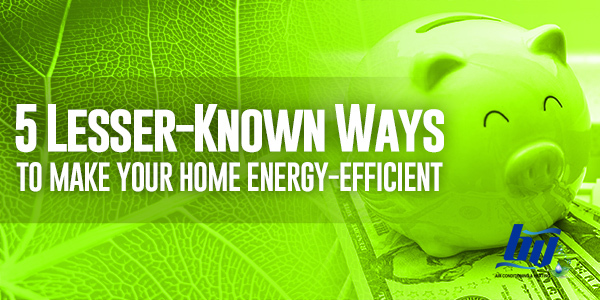 Here are 5 lesser-known ways to make your home energy efficient. You can always open your windows in the morning to let fresh air enter and circulate all throughout your home. Do not depend on your systems too much. Allow natural heat from the sun to save you from additional expenses and to allow your appliances to rest for the day. Double glazing can also cut a share off your monthly energy bill. You can always choose a design that will fit your home. It is costly but really efficient to use. During the summer season, it is good to have shady plants in your backyard to protect your home from direct heat from the sun. Trees and their leaves can block sunlight preventing your cooling systems from working too much to keep your home cool. They can also shield your home from the cold winds of winter. Planting trees and landscaping the outside of your house can give an eco-friendly appearance of your household, so it can be a positive solution on both accounts. Turn your gadgets off when not in use. Keeping your gadgets turned on round the clock is also a cause of high energy bills at home. It is a common mistake for homeowners to think that their appliances won’t consume energy when not in use, so they do not bother turning them off. Unplugging your devices when not in use saves you on your energy consumption. If you are trying to leave your home for a long time, make sure to even turn off your refrigerator (clear out any food that can spoil). This will not just reduce your energy bill but secure safety in your home as well. Try solar panels to power your home. Solar panels can be expensive upfront, but are very efficient when it comes to energy consumption. Research says that installing solar panels in your home slashes down electricity costs. It is also an eco-friendly way of improving energy efficiency in your home. If you can afford to install one, using solar panels is worth your money. Refrain from overusing your appliances. No matter how energy efficient your heating and cooling units are, it is still not right to overuse them. Using your systems too much will definitely give you a rise in your energy bill no matter how efficient your unit is. There are different tricks you can do to avoid too much dependence on your heating systems for the winter season. For instance, use your fire place to increase warmth in the house. Since the bed is pretty inviting in this weather, you tend to sleep more often. Add thick blankets and use socks when you sleep to reduce your heater’s job. For more tips to make your home energy-efficient, the best option is to invest in high-efficiency heating and cooling systems installed by a qualified technician.